Home > Memories of Alhambra + Patreon Launch! If you saw our Memories of Alhambra YouTube meetup post (and read all the way to the bottom) then you might have read about this little Patron thingy that we are trying out. We are kicking off our Patreon page with our first post which will be Memories of Alhambra! We plan on posting sometime tonight after watching Memories of Alhambra at our YouTube Meetup Live Watch tonight!. Patreon is a site dedicated to giving creators a way to have more control over what they do through people donating to them for their services. This is basically a game changer for a lot of people who would like to go full time doing that thing that they do. Here is a summary from their site on how the founder created Patreon. That solution was basically for people to support the outlets that they check out. Makes sense. We would like to use Patreon to 1st, get rid of the pop up ads we have on our site. Those pop up ads help us pay for our server, but they are pretty annoying. If things go well then we would love to get rid of all pop up ads on our site and possibly all ads in general so that our site would be nice, neat, and sleek once again. But what does this have to do with Memories of Alhambra? Well, Memories of Alhambra is the first drama that we are offering to our Patrons as a First Look! We will do the Memories of Alhambra live recap as it airs on Patreon and then post the recap over here on Drama Milk 24-48 hours later. That way no one will be left out, but if you are really feigning to know what happened, then we got you covered. Here is what we are offering to our Patreon’s for $1 or more per month support! We will dedicate two dramas to our recap schedule that Patrons want us to recap (vote vote vote). This drama will not get dropped. (Unless everyone votes to drop it and pick up another one). Our Saturday/Sunday live recap will be a Patreon Only “First Look” recap that will be posted on Drama Milk 24-48 hours later. Our first Patreon “First Look” drama is Memories of Alhambra! Whoo Hoo! Our weekday is going to be the same with postings right now. Our weekends are going to go to Patreon first for Memories of Alhambra and then we will post those two over here. Here is a look at our Patreon, but go to this site to check it out in person and support if you can. If not, all of our content will be available over here on Drama Milk as well after it is available on Patreon. 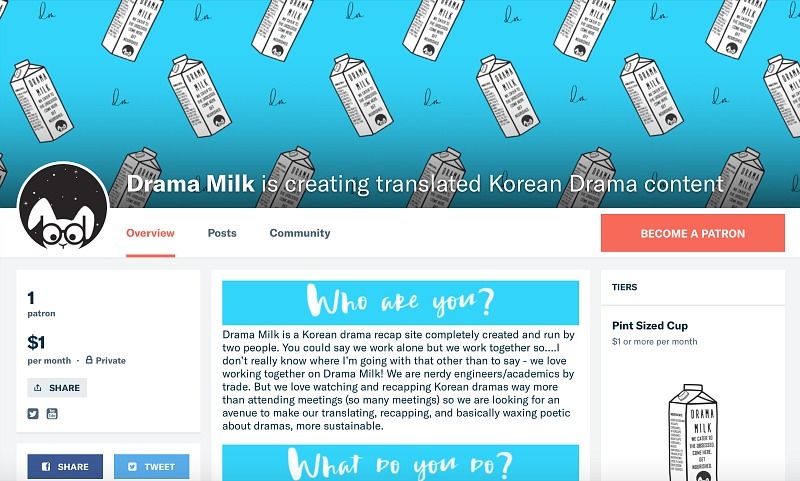 Plus, from this day forward we will additionally post all of our posts from Drama Milk onto Patreon so if you want to brows ad free and support us then head on over there! GO HERE TO SUPPORT US ON PATREON AND GO HERE TO WATCH MEMORIES OF ALHAMBRA WITH US TONIGHT!